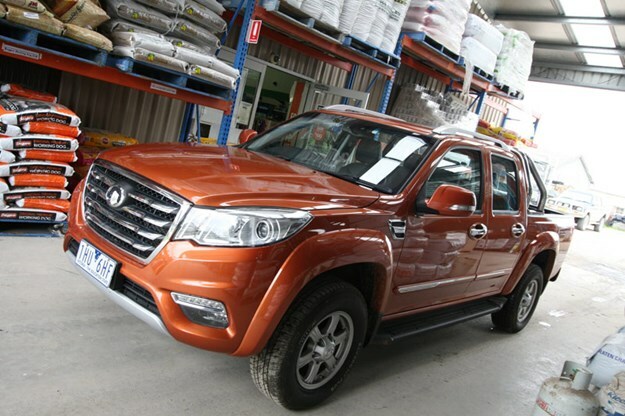 The Great Wall Steed 4wd dual-cab you see here sells for a current drive-away price (including rego and stamp duty) of just $24,990, yet it has features that you can’t get on most other utes at any price. It offers, for example, the safety and functionality of on-demand 4wd where even the most expensive Toyota Hilux and Ford Ranger have to make do with relatively primitive part-time 4wd. It also comes with rear disc brakes, a feature only found on the most expensive Ranger, the $80K-on the-road Raptor, and VW Amarok V6 models, the least expensive of which is twice the price of the Steed. 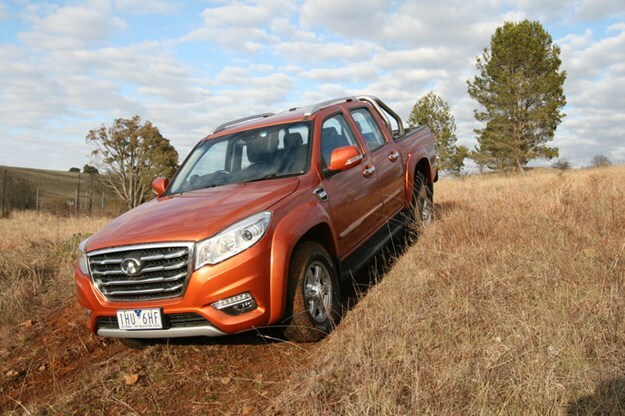 The Great Wall Steed isn’t notably big like some current generation utes, but more the size of the typical dual-cab of 10 years back; something like the last of the Holden Rodeos or a Nissan Navara D22. The Steed also sits a little lower than most current 4wd utes, which means even those short in stature probably won’t need the sidesteps to climb on board. Once there you’ll find yourself in a cabin that says anything but ‘budget’, if that’s what you were expecting given the $25K drive-away asking price. Not only does it have seats covered in what looks and feels like leather, but the front seats are heated, the driver’s seat has electric adjustment, there’s a decent-sized touchscreen and the general fit and finish is very good. 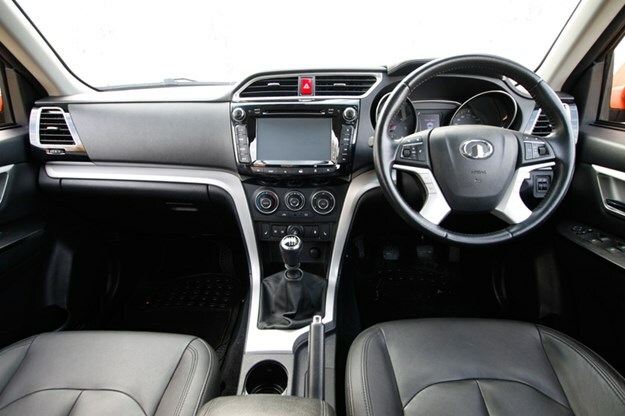 Look at bit closer and you’ll find a six-speaker audio system, auto wipers, auto headlights, tyre-pressure monitoring system and steering wheel controls for the cruise control, audio and Bluetooth phone connectivity. Our test vehicle also had sat-nav, which is a $990 option across the range. You’ll also find the driver’s seat comfortable and there’s a good range of seat adjustment, although the steering wheel only has tilt adjustment and no reach adjustment, which is not uncommon among current utes. The fact that the Steed is a smaller ute than many is not felt up front where there’s plenty of room, but the rear seat does suffer for both legroom and shoulder room if you’re trying to accommodate three adults. No centre headrest in the rear either although there are three lap-sash belts. Fire up the 2.0-litre four-cylinder diesel and you’ll be surprised how quiet it is and once underway the engine continues to impress with its general refinement. Off idle the power is a little lacking, but once you get past the initial turbo lag the performance is adequate, even if it isn’t exciting. 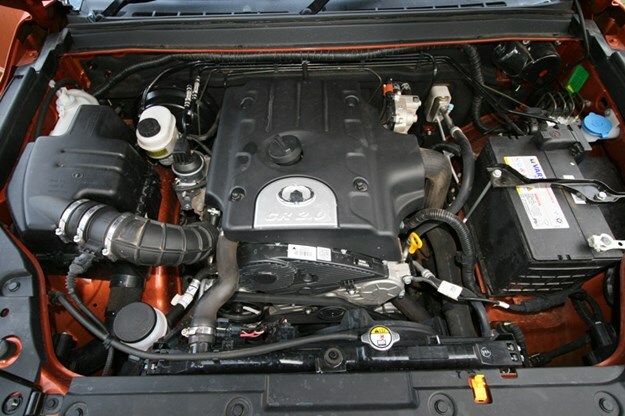 The engine claims 110kW, which is down on most current mainstream utes but still matches the entry-level 2.4-litre diesel in Hilux and is typical of the sort of power output of last-generation diesel utes. On the highway, and even on hills, the Steed still gets along in a reasonably effortless manner helped by the fact that the overall gearing isn’t overly tall, with top gear of the six-speed manual giving around 50km/h/1,000rpm. It’s only when overtaking at highway speeds that you feel that more power would be handy. For its part the six-speed manual – the only gearbox on offer – has a light and easy shift action even if it’s not quite as precise and positive as it could be. Much the same can also be said for the steering, which is also very light and could do with a little more feel and feedback. The suspension also feels a little underdamped, especially at the front, but our road-test vehicle had over 20,000km on it so this might just reflect a hard life and tired dampers. On a more positive note the Steed has a sophisticated 4wd system via a Borg-Warner torque-on-demand transfer case. 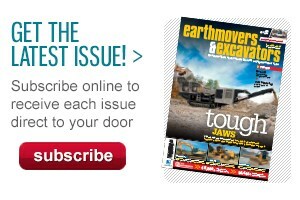 The driver can select 2wd (rear wheels), on-demand 4wd (all-wheel-drive on the selector) or low-range 4wd. 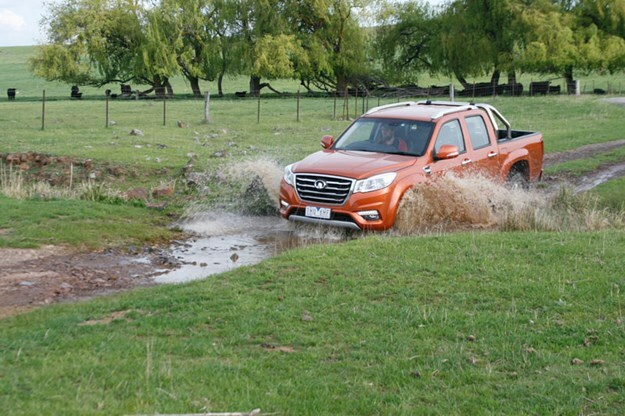 The on-demand 4wd setting can be used on any road surface (including dry bitumen) and it means you can drive straight from a sealed road into a paddock or off-road trail without having to manually select 4wd as the system engages drive to all four wheels as and when needed. This on-demand 4wd system is particularly useful (and safer) on wet bitumen and when road conditions change back and forth between sealed roads and gravel roads, especially with a bit of rain in the mix. The Steed is a handy enough ute for paddock or off-road work although it’s a bit low slung compared to most mainstream utes and could do with more ground clearance. It does however have a solid bash plate under the front of the engine, which is just what you want if you hit a hidden rock or stump. As mentioned, the automatic on-demand 4wd system is handy as you don’t have to manually select 4wd if you go from road to paddock. For more difficult or slower-speed paddock or off-road driving the Steed does have low-range 4wd, which also locks the drive from the transfer case 50/50 front to rear. 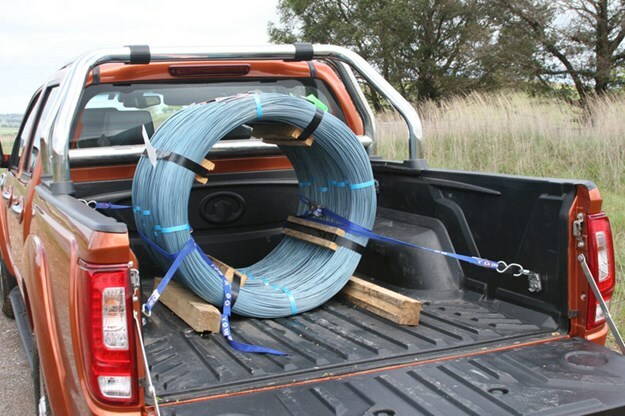 There are no heavy-duty recovery hooks if you do get bogged, although there are tie-down hooks at the front and the rear, which can be used for recovery in an emergency. The Steed has a handy 1,020kg maximum payload, but only a modest 2,000kg tow capacity. With no towbar fitted to the test vehicle we couldn’t do a tow test but we did load it up with 600kg of fencing wire to test its load carrying ability. With driver and passenger on board that took the payload to 750kg, all of which the Steed took in its stride without raising a sweat. Surprisingly the modest engine coped well with the load, as did the chassis, and the overall impression was that increasing the payload up towards the maximum figure would present no problems for the Steed. A plastic tub liner and four tie-down rings mounted mid-height in the tray are standard. Like most utes the Steed won’t take a full-sized pallet between the wheelarches in a tray that measures roughly 1.5 metres square. The good news here is that since mid-2016 the distribution of Great Wall utes in Australia has been taken over by a fully owned factory subsidiary, whereas previously a third-party distributor sold Great Walls here. This factory backing should bode well for the future. Currently there are 34 Great Wall dealers in Australia and the Steed comes with a three-year/100,000km warranty. There’s no doubt that the Steed offers excellent value for money in terms of equipment even though it falls short of what the mainstream utes do in terms of performance, on-road dynamics and towing. But you could say that it offers 100 per cent or more of what the mainstream utes do in features, performs about two-thirds as well, and costs 50 per cent or less, all of which seems to be the making of a value-for-money equation. The single-cab 4wd variant possibly represents even better value than the dual-cab and would take a lot of beating as a work or farm ute. *Drive-away price at time of writing. 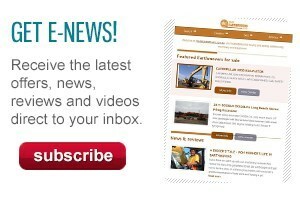 Includes registration, stamp duty and dealer charges on all models, and alloy drop-side tray on single-cabs.